Reading this series has become a bit of a family affair for me this week. It started with our 10-year old son, who brought it home from the school library after I challenged him to try reading some books that are not graphic novels. He's dyslexic, but he's had some miracle-worker teachers and school interventions in the past three years. Despite his struggles with reading, he's really grown to love it. Until recently, however, he has mainly read Dog-Man, Big Nate, and Captain Underpants books over and over and over. He's reading this book at his own pace and is currently about halfway through. My husband read this entire series several years ago, and excited that our son wants to read The Ruins of Gorlan, he's just started reading it again. Then, my mom got in on the action. Yep, my 66-year old mother, an avid reader, also likes to read what her grandsons are reading. She also loved the book and inhaled in just a few hours. She then mentioned it to my sister, whose 10-year old son--my boys' cousin--is now also reading it. So now, after many years of listing The Ranger's Apprentice series on my lengthy TBR list, I have finally, finally carved out some time on a rare Shanghai snow day to read it myself. SUMMARY: 15-year old Will is a ward of the castle, an orphan raised with four other orphans as protected wards of Baron Arald, Lord of Redmont Fief. On his Choosing Day, Will hopes to be accepted into Battleschool, where he will train to be a knight like his father once was. Instead, Will is chosen to be apprentice to the mysterious Ranger Holt. 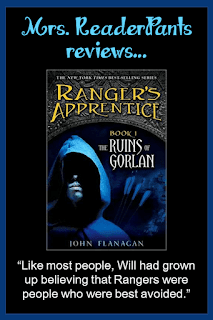 REVIEW: My husband read the entire Ranger's Apprentice series several years ago, and he still says this is his favorite YA fantasy series. The Ranger's Apprentice series has been a popular choice in my libraries--particularly among boys--for nearly my entire career as a school librarian. Though I recommend it frequently to my students, I had never actually read it myself. Until now. What I love about this series is that I can recommend it to just about anybody. It's clean (no profanity), it's action-packed, it's relatively short, and it's got a great front cover (well, several different covers). It also seems that students who read the first book in this series ultimately go on to read them all. I talked to a ninth grade boy at school about it this week, and he said he has read the entire series FOUR TIMES. Give it to fans of Game of Thrones or Harry Potter or Lord of the Rings--it's practically guaranteed they will return for the next book. I'd even say that students as young as fourth or fifth grade could enjoy this series. My fifth grade son, an avid graphic novel reader just discovering longer novels, is also reading it now and loving it. And as my husband, my mom, and I prove, adults will enjoy this series as well. So what's so great about this series? Well, we have a 15-year old boy named Will. As an orphan and ward of the castle, Will isn't too high on the social totem pole. Nor are his friends and fellow orphan-wards: Jenny, Horace, George, and Alyss. Will wants to become a knight like his father was, but on his Choosing Day, he is denied entry into Battleschool. Will is instead taken as apprentice by Halt, a ranger whose quiet ways and seeming ability to make himself invisible scares Will. For me, the story was a bit slow at first, but once Will moves in with Halt and begins his training, the pace picks up considerably. I especially love how some chapters are from Will's friend Horace's point of view. Unlike Will, Horace does get into Battleschool, where he is relentlessly bullied and humiliated by three older boys. We also get small glimpses into the apprenticeships of Will's other friends, which tells me these characters will be important as the series goes on. I guess what I loved most about this book is that it was like watching a great fantasy movie. I could picture the sweeping landscapes, hear the whistling of the Stone Flutes, and smell the red-eyed Kalkara. The characters are still developing in this book, and I'm interested to see how their stories intertwine as the series continues. Even the horses are given personalities and stories of their own. So the question is, will I read the next book? There are actually very few series that I have read all the way through, and none of them consist of twelve books. If I read this entire series, it will find itself on a short list that includes Harry Potter, The Hunger Games, and Gregor the Overlander. I am usually content to read just the first book in a series, so that I can talk it up in the library. But this one? It's possible I would read the entire series...I do really like the idea of seeing how the lives of Jenny, Horace, George, Alyss, and Will develop as they grow older. THE BOTTOM LINE: This is a well-loved series that's been part of my libraries for 12 years now. It was popular when it first came out in 2006, and it's still plenty popular in 2018. You probably already have The Ranger's Apprentice series in your library, but have you read it yet? I highly recommend it to all librarians, teachers, and parents who want to place great books in the hands of our teens and tweens. STATUS IN MY LIBRARY: Both our Primary and Secondary School libraries have all the books in this series. And as I mentioned several times, they are popular. Read the whole thing--then read the Brotherband series by Flanagan! I'm likely to! I can see how this series would get more in-depth with the characters and plots as it goes on. John Flanagan came to a school in Sydney where I was teaching and spoke to about 120 Year 7 boys, (and about a dozen others who heard he was coming) and they loved hearing him speak. Will is based on his own son and he wrote the series to encourage his son to read.